I hate to be the one to break it to you, but 2016 was a bit of a garbage fire. Continuing conflict and suffering in Syria, gun violence, wildfires, terrorism, Prince and Bowie and Carrie Fisher… I feel like I’m missing one? Oh right, the election. I’m not going to try to convince you that wasn’t all horrible, with more sorrow to come. But I’ve been doing this nonprofit fundraising thing long enough to know that people STEP UP when things are darkest. Unprecedented challenges drive unimaginable generosity. And nowhere was that more clear than during the December end-of-year (EOY) fundraising season. Here’s our annual data tour, aggregated from 22 organization’s EOY results. Of the 22 organizations who provided data from both 2015 and 2016, all but 4 of them raised more revenue in December 2016 than they did in December 2015. The median organization in our sample saw a 12% increase in total online revenue. A few organizations saw big, big, BIG increases during EOY 2016, for reasons that we’ll dig into later — and as a result, these 22 organizations raised $62 million in December 2016, compared to $39.3 million last year. That’s a 58% jump! Send that email…. Or don’t? But definitely still do. Only one organization that increased their appeal volume this year saw a decrease in email revenue. All other organizations in our sample saw a correlation between increased email volume and increased email revenue, while decreased volume resulted in uniformly decreased revenue. 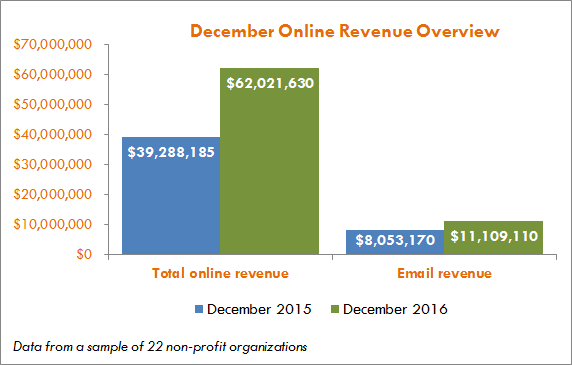 The share of online December revenue attributed to email rose from 16% in 2015 to 20% in 2016. However — the overall trend in response rate to email was essentially flat, with 52% of our sample staying the same and 44% of our sample losing a bit of ground. Only 3 organizations in our sample saw improvements in email response rate this year. Nonprofits are increasingly diversifying the ways in which they reach new audiences online — including digital advertising. About two-thirds of the groups we surveyed implemented digital ads as part of their EOY fundraising strategy, including Google Adwords, Retargeting, and Facebook Ads. Of the 10 groups for which we have revenue breakouts, more than 5% of total December revenue is attributed to view-through of an ad. Doesn’t seem like much, when you compare to email — but considering that users may see an ad here or there and end up donating through a different channel, digital ads are a platform to watch (and begin investing in, if you aren’t already). Giving Tuesday was in November this year, which means none of that juicy revenue is included in our December comparison above. That doesn’t mean that it isn’t important! Continuing the trend set in the past couple of years (or, well, since the beginning of Giving Tuesday in 2012), promotions and revenue were up significantly. The median group in our sample saw a 62% increase in their Giving Tuesday revenue over 2015. Part of that increase could be the additional work nonprofits are doing to entice donors into giving on that specific day: of the 22 organizations for which we have year-over-year data, 73% featured a single-day $1-for-$1 match, premium (like a water bottle or a tote bag), or another special offer on Giving Tuesday, compared to just 38% of organizations in 2015. We are never fundraising in a vacuum, and 2016 went out of its way to rub our noses in that fact. Elections have consequences. Of the 31 organizations who provided data for this post, one-third of them directly fundraised off the results of the election in November and December and recorded an average 12% improvement in revenue year over year. The organizations that called out direct threats to their organization’s mission were also among the groups that saw the highest year over year increase in revenue, averaging a 103% increase. The conflict in Syria is an ongoing crisis, which saw a dramatic turn for the worse when civilian populations became increasingly targeted. Dramatic shots of children and women in affected areas drove the conflict back into mainstream news, after being largely absent for several years. The 5 groups in our sample that work on international relief and messaged specifically on the crisis in Syria saw a 16% average increase in year over year revenue. Perhaps as a result of the election and impending new administration, or perhaps as a result of increased monthly donor promotions, upsells, and donor loyalty, groups saw huge increases in the number of monthly sustainers recruited during December. The 14 groups in our sample with year over year data reported a median 58% bump in the number of sustainers recruited, with a 27% bump in new recurring revenue. Average gift for those new sustainers fell by 12%, indicating that while more people are coming on the file as loyal monthly donors, they are doing so at a lower dollar level. The groups that messaged specifically on the outcome of the election saw a whopping 201% average increase in monthly donors, on average. The groups who messaged on Syria did about as well as the other groups, averaging a 58% increase in monthly giving. That’s the one question to rule them all. We’re in uncharted territory here in a lot of ways — but we’re not without hope. The fact that fundraising is up (and up!) for these worthy nonprofit organizations is an indicator that people care — they believe the world can be a better place, they believe in the mission, they believe. So while our present reality is unprecedented in many ways, the old rules still apply. Keep your fundraising relevant. Keep the email coming. Invest to connect with new audiences, and to convince audiences you already have to donate. The world is listening, and they want to hear what you’re saying. Go get ‘em!